The word 'occult' means hidden. There's nothing particularly nefarious about this word, in the same way that there's nothing very nefarious about the content of 'Hidden Secrets', despite the extravagant claims on its cover. Like the occult, the substantive content of the book is hidden. But not, perhaps, in the way defined by its author. The book is laid out in 3 sections. Essentially, the core of the book is a collection of poems composed in 1997, and the poetry itself is the third part of the book. This part was written first, and presented last. The poetry is metaphysical in places, and rather gloomy in character. I have to say that, personally, it didn't grab me. However, the other two sections, which introduced the poetry, were of greater interest. Donald Ryles clearly spent some time and effort trying to get his collection of poetry published and, as happens to so many poets, found it tough going. In the wake of the 9/11 attacks on the East Coast of the USA, he turned his attention to the structure of his unpublished poetry collection, inspired, I suspect, by such radical publications as 'The Bible Code'. In the style of 'The Bible Code' he used numerology to wade through his poems, and found patterns emerging before his eyes. Now, I'll leave it to the reader to decide whether such an adventure is worthwhile or not. It certainly appears to have been grossly time-consuming. Donald Ryles then used this methodology to re-package his poetry collection as prophecy. Essentially, though, he works backwards from 2001 to work he wrote in 1997 to decode his own prophecy. The actual poetry is not about a 9/11-type event, I should point out, but the numerology creates artificially selected phrases that are suggestive of the coming terrorist atrocity. This is very interesting as an experiment, I think. 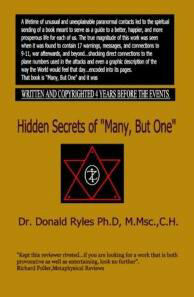 People relate to 'The Bible Code' because it's worked out from, well, the Bible. But what happens if you use this kind of numerological method, or similar, on other works? Would it still throw up material that some will consider esoteric and substantive? Could you do the same, say, with the Constitution of the United States of America? Or even with something quite mundane, like a chick-lit novel, for instance? Could we discover occult meaning in Mills and Boon, for instance? I suspect that Donald Ryles had similar thoughts going through his head as he put together his 'connections' between his 'Many, but One' collection of poems, and the 9/11 terrorist attacks. His answer to this quandary was to establish his credentials as a seer. This, for me, is the essential part of this rather bizarre book. The first section of 'Hidden Secrets' devotes itself to the author's remarkable exposure to the paranormal. As a kid, Donald Ryles and his family encountered many strange goings-on in their house, and elsewhere. His accounts seem genuine enough, and some seem inexplicable using rational means. It seems highly likely that dabbling with a Ouija board brought forth some trouble from the lower spirit world, a mistake he repeated later in his childhood. Some of the experiences are right out of the Twilight Zone, particularly the ones involving buildings or interiors which were mysteriously re-located. Others, like the repeated, anonymous phone calls to public phone booths, which the author unwisely answered, seem less spiritual, and more disturbing in terms of the kind of human predators which the author seems naively unaware of. The purpose of the paranormal accounts is presented, then, as a foundation for psychic powers of clairvoyance. Hence the poetry's occult meanings, decoded after the event. This argument is unconvincing to my mind. But I still enjoyed the ghost stories that might not have seen the light of day otherwise. Donald Ryles hints at other tales of the paranormal which he does not reveal in this book, which was a shame. I would have enjoyed them too. They could have replaced some of the more tenuous apsects of this work of prophecy.